In one of the most famous and splendidly-triumphalist scenes in Christian hagiography, the 8th century Christian chronicler Willibald depicts the destruction of the fabled Donar Oak by St. Boniface, an English missionary, which marked the beginning of the end of Germanic paganism and served as one of the definite symbolic catalysts of the new Germanic Christian Middle Ages. At the same time, this scene is strangely apropos to the contemporary religious divide in the mighty oak of American conservativism. If the mushrooming of neo-pagan, “esoteric” Facebook pages, Twitter accounts, and blogs are an indication that many traditional conservatives, especially members of the Alt Right, want to replant the mystic oak chopped down by St. Boniface. And a vexatious series of questions has arisen among many who are rediscovering traditional ways of life. Is Christianity at fault for the death of the West? Were the condemnations of Christianity as a fundamentally effeminizing Eastern religion that sapped the life blood of Western civilization made by the German philosopher Friedrich Nietzsche and Enlightenment English historian Edward Gibbon right in the end? Would a return to pre-Christian ways of life and even worship make the West great again? The first response from traditional Catholics is that St. Augustine of Hippo in his weighty City of God already answered this question 1700 years ago—long before Nietzsche’s Genealogy of Morals and Gibbon in his Decline and Fall of the Roman Empire: the answer is “no”, it was the distinctly pagan immorality and corruption of the both the Romans of the later empire and the Europeans of late modernity that should have received Gibbon and Nietzsche’s scorn. In fact, the arrival of Christian missionaries in Europe, winding their way up the Viking-infested rivers and through the dark unconsecrated forests, were welcomed by the average pagan. While the testy Scandinavians resisted Christianity and were among the first to abandon it to Luther’s new religion, our European ancestors welcomed the missionaries who relieved them from the terrible burden of human sacrifice and fear under pagan rule and, to this day, Catholics have served at the forefront of preserving and defending European civilization. Today, the reason why countries like Hungary and Poland resist Islamization and globalization is because they have kept their faith; they want to live, and they want to live for Christ. It is this point that still divides the right. David Duke cannot gain the same level of electoral support he once did 25 years ago, but his intellectual children have come to make daily national news and are one of the strongest and most aggressive political presences on social media. When in his “Culture Wars” speech, Buchanan announced to the 1992 Republican National Convention that “we must take back our cities, and take back our culture, and take back our country”, he was not talking about a race war; he was talking a spiritual war. It is only traditional Catholics who are equipped to fight this war. Catholics were reactionary before being reactionary was Tweetable. 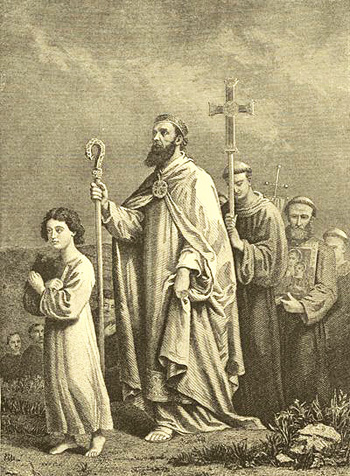 The Alt-Right is rightly disgusted with the buddy Jesus, high-fiving Evangelical Catholicism, but they are wrong to think this sentimental and effeminate Christianity is the Christianity that was given to the Irish by St. Patrick or to the Slavic people by Saints Cyril and Methodius. The Christianity of the Beowulf poet or that of St. Thomas Aquinas, himself a member of an aristocratic Norman-Italian family, is not the Christianity of Pope Francis or Rick Warren. For two millennia, the borders of Europe were defended by Christian knights who shed their blood fighting waves of migrants seeking to chain our ancestors under the yoke of Islam. Catholics were reactionary before being reactionary was Tweetable. Catholics do not so much reject the modern world as what the modern world is—a rejection of Catholicism. European people were disgusted and bored in the 19th century reading the poems of Baudelaire, Poe, and Rimbaud when the majority of European countries were 99% European precisely because we had abandoned Christ for Odin, Zeus, and worship of the fatherland. Western people began to destroy themselves when they rejected their baptism and turned their back on God. The future of our civilization can only be built on the one firm foundation of Jesus Christ, Our Lord. The driving force of true arête or excellence for Westerners has been, since the time of Constantine, what St. Ignatius of Loyola called ad majorem dei gloriam, all for greater glory of God. It was the love of Christ that inspired Columbus to sail across the Atlantic and Cortez to destroy the pagan Aztec empire. It was the greater glory of God that impelled the construction of the great gothic Cathedrals of Europe, modeled on the mead halls and dragon ships of Vikings who skimmed the seas. Our drive for excellence as a people cannot simply be the desire for honor or the glory of the family or the wider fellowship or comitatus of the nation, for all of this is merely morbid materialism without the hope of salvation or eternal life. We must have a moral awakening and call to conversion to the one true faith of our fathers. If we kill our own offspring for eugenic or other reasons—as has been suggested by many in the Alt Right—we are still on the road to self-extermination. After the success of Trump and the triumph of nationalist figures like Brazil’s Jair Bolsonaro, Italy’s Matteo Salvini, as well as Victor Orbán, it is clear that populism and a resurgence of a healthy sense of identity among Westerners is here to stay. The only question is: will this be a new Christian populism or a poisonous pagan one? The men and women of the West are thus faced with the choice presented by the great French mathematician and philosopher of the 17th century, Blaise Pascal. The fate of the West is deeply tied to the fate of the world, and only a Christian West will have the will to survive. Don't miss Dr. Russell's regular column in the Print Edition of the Remnant Newspaper -- Subscribe today!